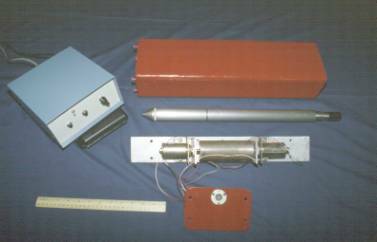 Various wave-generating systems are available for downhole geophysical testing which include: manual striking with a sledgehammer, a pendulum design (Campanella 1994), pneumatics (Liu et al, 1988), and hydraulics (Vertek, unpublished, 1988). One benefit of all these systems is the ability to generate large amounts of force, which can aid in producing shear waves that propagate to great depths. The hydraulic and pneumatic systems however need dedicated air compressor or high-pressure tank, or a hydraulic pump and reservoir. Both fluid-based systems are also quite bulky and are not easy to maneuver. The manual sources, although very simple, require separate personnel for operation. In order to improve repeatability & accuracy of downhole shear wave testing, an automatic seismic source was developed for use in seismic piezocone testing. The source could increase both consistency and productivity. AutoSeis, would be small, portable, easy to use, and able to generate shear waves that are more uniform and repeatable. The AutoSeis was initially tested at the National Geotechnical Experimentation Site (NGES) in Spring Villa, Alabama and compared well with crosshole data. Later testing was conducted at two USGS test sites in the Mid-America earthquake region near Memphis. With good shear waves generated to a depth of 20 meters (~65 feet), the first iteration of the AutoSeis has proven successful and has provided the necessary information for the design of an improved version. The required shear waves can be generated with a relatively small force when using electronic penetrometers with downhole amplification of the signal. An electrically-driven solenoid source would be the best choice since there is already an electrical power supply available with the CPT rig. Aluminum components and a compact design make the system relatively lightweight and mobile. These characteristics are important when the testing location prohibits the use of a dedicated CPT rig or travelling long distances where it is not cost-effective to transport your own CPT rig. The AutoSeis can be easily shipped or packed in luggage for convenient transport. The AutoSeis features a short fin that is inserted into the soil before testing. The fin moves the shearing plane into the soil to enhance the generation of horizontally-polarized vertically-propagating shear waves and minimizes the amplitude of compression waves.